Hi. I’m Leah. I’m an 18 year old university student and I am blessed to live on the Sunshine coast of Australia. If you haven’t been, I am sure you can imagine what this means. I mean how crazy is this! Beautiful beaches, outdoorsy lifestyle, and all that comes with that, including the sometimes merciless sun. Unfortunately, one of the things that stuck with me when I moved over from England at a young age, was my pale skin. I cannot tan to save my life. 30 minutes in the sun and boom, I am a lobster. I also class myself as a self-taught makeup lover. 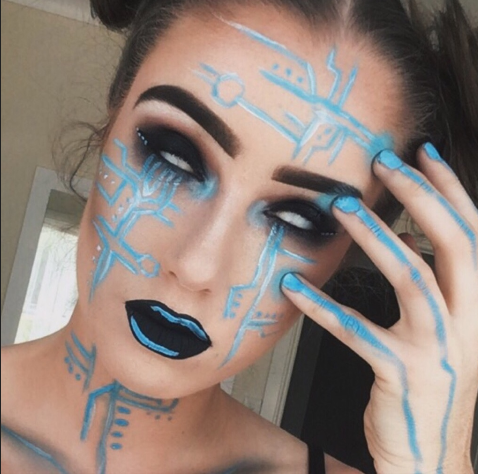 I love the creativity makeup gives me. I spend countless hours (and too much money) on transforming my face into weird and wacky creations, yet the most important thing about any kind of art, is protecting and preparing the canvas you work on. Recently, in the makeup world, skin care has become more and more relevant, and people are paying a lot more attention to this vital organ. A part of skin care that is often overlooked for the trend of tanning, is sun protection. Dry skin is one of the main symptoms of sun damage. Often, after long exposure to the sun, the skin can start to lose moisture and oils that naturally occur, causing the skin to suffer. Dry skin is the worst! Trying to apply foundation to skin that flakes up as soon as your blending sponge or brush even touches you has to be up there with climbing Mount Everest on a scale of difficulty. Not to mention how itchy it can get! All in all, it’s not a good time. Your skin needs moisture to live. Hydration is so important for the replenishing of cells. With dry skin due to sun damage, your skin struggles! All of your blemishes are more prominent and any slight wrinkle or line in your skin is accentuated. I’ve got to say, premature wrinkles are not on my too do list. Fortunately there are ways to prevent this! Really the most important thing is to block out those UV rays that are causing the damage. Whether it be by wearing a good sunscreen, wearing a hat to protect your face, or covering up with some UV protection clothes, like Stingray’s, blocking these rays are the only way to protect your skin against sun damage. Although prevention is much better than treatment, it is never too late to start caring for your dry skin caused by sun damage. A good moisturiser can often help plump up your skin and give it the hydration it needs, and UV protective clothing can block any UV rays getting to your skin from now on, stopping further damage. Sounds great right? Your skin health should be your biggest investment. So go forth! Conquer the UV rays and dry skin! Go and enjoy the sun with the proper protection and come out on top, sun damage free.